Today I have another Charm Your Nails beauty to share with you. It's dark, mysterious and perfectly balanced : I present to you Mal-eficient Magic! Mal-eficient Magic is complex mix of warm purple, green and black glitters in various shapes and sizes ( square, hex and bar) in a clear base infused with a green shimmer. I decided to pair it with Estée Lauder Bête Noire so I added one coat over that. Application was easy as a breeze. As I said, I only used one single coat and the glitters applied nicely without having to "fish" any of the big ones. Oh and I just love how it looks over Bête Noire! 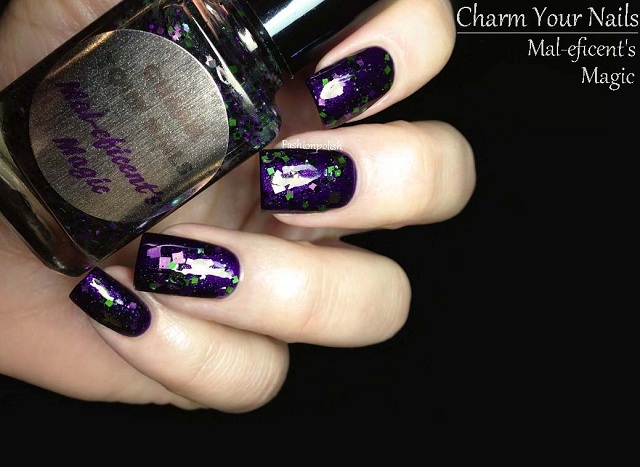 Mal-eficient Magic can be purchased from Charm Your Nails Etsy Shop and retails for $8.50 (0.5 oz) or $3.50 (0.125 oz). So pretty!! I love these kind of glitter combinations! 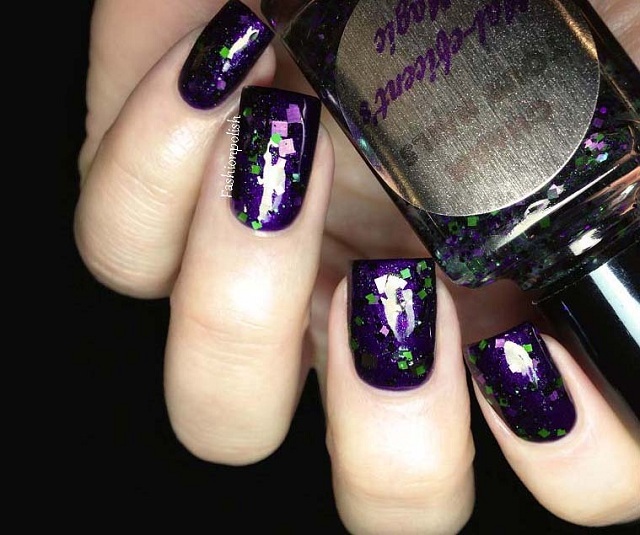 I love the green and purple glitter together and it looks perfect over the purple polish! The glitter looks great!!! I love the purple and green color combo! It's gorgeous. I can't believe it's only one coat! Your nails look great. I love the purple and green glitter!